Cognitive behavioral therapy doesn’t fix everything for everyone. Please don’t tell me I just need to try cognitive behavioral therapy. A few weeks ago, I made an appointment with a therapist who specializes in cognitive behavioral therapy—CBT as it’s known to professionals and those of us who have way too much contact with the mental health care system. After months of struggling to find the right doctor and to get on a medication regime that could tamp down the worst of the physical pain that accompanies my condition, I had finally found the right medical mix and was feeling stable. But I still had some lingering negative thought patterns I wanted to kick, precisely the kind of thing CBT is supposed to be good for, which is why I scheduled the appointment. I went in expecting some helpful worksheets and mental exercises. This wasn’t the first time something like this had happened to me. A couple of months prior, desperate and unable to eat or sleep, I had gone to a psychiatric hospital. I knew from experience that it was time to make a significant medication change, and I expressed this to the nurse practitioner handling my case. She came back with the recommendation of a three-week course of intensive outpatient CBT. I pleaded to talk to the attending psychiatrist, who thankfully agreed with my own assessment and got me on the track to recovery. This whole course of events had been kicked off much earlier at an appointment with my then-psychiatrist—I had gone to him certain that the medicine I was on was “pooping out,” a well-documented but little understood phenomenon I typically experience every few years, in which a previously reliable medication just stops doing the trick. I’ve always solved this problem by rotating to another drug. But this time my doctor resisted. He had been reading up on CBT and was convinced that if I worked hard to change patterns in my thoughts, I could learn to control the problematic feedback loop between my brain and body. He insisted I try CBT before switching meds. I elected to find a new psychiatrist, a process that took weeks—long enough for me to spiral down into a hole I’m just now climbing out of. As it happened, I had already done a variant of CBT a few years earlier, in the hopes of getting some tools to cope with the stresses of moving to a new city and starting grad school. I’d pursued this type of therapy instead of a medication adjustment because the anxiety I was feeling had a clear object (something CBT is designed to address), and the sensations attached to it were quite different from those I experience when my mental illness is taking hold. Years of dealing with this condition have made me able to discern the difference between normal and pathological psychic pain in the same way that, as an athlete, I’ve learned to differentiate between minor aches and pains and a serious injury. Both need to be tended to, as the former can make you more vulnerable to the latter, but the treatments are different. As it turned out, for me, CBT techniques proved to be lesser tools for managing stress than my tried-and-true regimen of dance classes and long runs. I began to ponder my recent interactions with the mental health care system upon reading a recent New York Times Magazine story about severely anxious teens. 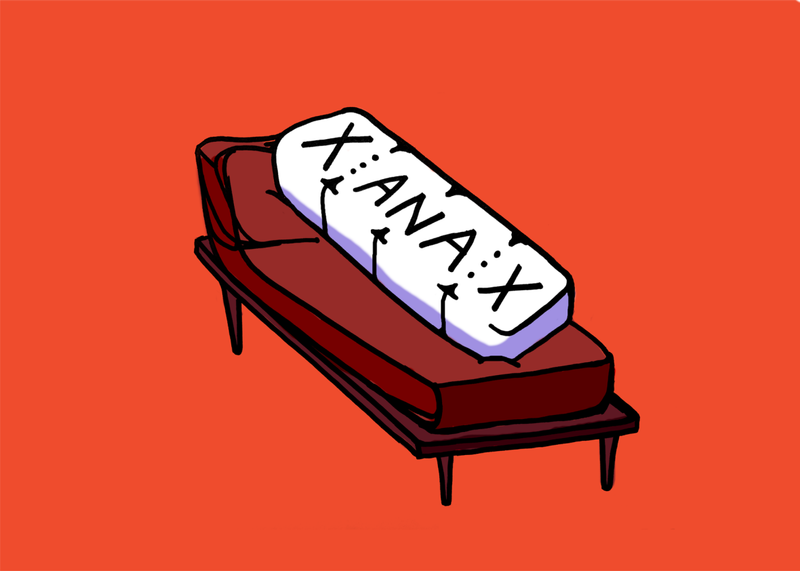 The article contains most of the standard hand-wringing the Times has been putting out over how anxiety is America’s national mood and how we’ve become “the United States of Xanax.” But I was most struck by a subnarrative that speaks to my experiences with many care providers, as well as broader beliefs I fear are spreading as CBT is having its cultural moment. The New York Times Magazine story highlights a young man, Jake, who suffers from paralyzing anxiety. When medication just “made a bad situation worse,” his parents sent him to an in-patient treatment center that practices CBT. There, he retrained his brain—“cognitive restructuring” in CBT lingo—and faced his fears through exposure therapy. The author and the clinicians he interviewed describe the therapy as “work” that is “uncomfortable.” At one point a woman in the piece describes an anxious teen doing an exposure exercise as “brave.” For Jake, in the end, this work pays off, and he goes off to college with a newfound control over his life and mind. But Jake has a foil in this story. It’s a young woman, Jillian, who goes through the same treatment as Jake, but with different results. Her anxieties return, she leaves high school, battles with her mother, and falters in her use of the CBT tools she learned because “it’s exhausting.” When we last see Jillian, she is in her “messy” room, where she chats on her phone and ignores the schedule she is supposed to keep. Beside her sit the bottles of pills that she “believes” make her better than she would be otherwise. The subtle ways in which we are led to question Jillian, not CBT, struck me as unsettling. In fact, highlighting one teen that benefits from CBT and one that doesn’t would be a fairly accurate representation of larger trends. According to a study cited in the story, CBT showed about the same rate of effectiveness in treating anxiety and depression as a selective serotonin reuptake inhibiting, or SSRI, medication—a little more than 50 percent—with better results when combined. In the thorny world of mental illnesses, these are good outcomes for both modes of treatment. The Times story isn’t celebrating the effectiveness of SSRIs, though. Why highlight CBT? Because unlike medication, it’s not just effective; it’s also virtuous. You might say my story is the opposite of Jake’s. I’ve tried numerous forms of therapy, from traditional counseling to hypnosis, and yes, at this point, a couple attempts at CBT. I’ll probably keep trying new forms of therapy. But thus far, none have been able to replace—or, to be honest, even augment—medication. I’ve also always experienced an element of moralizing around therapy by health care professionals. As therapy has become more acceptable in the broader culture, it has also come to be expected of people who take medication to control disorders. As one general practitioner at my university chided while making me promise to see a counselor along with a psychiatrist, “you have to do your part.” But while a moralizing rhetoric runs through many types of therapy, CBT’s is a particularly virulent strain. The first element of CBT’s moral claim lies in its identity as an evidence-based intervention, bolstered by the existence of a great deal of data to show its effectiveness. On its own, this is a positive development in psychotherapy. However, just because CBT might, on aggregate, be as effective as many drugs does not mean that it will be as effective as medication for any given individual. This subtle point is missed by some practitioners. The main aspect of CBT’s moral superiority, however, lies in its purported strength: It places the patient in the driver’s seat of the therapeutic process; the therapist is conceived of as more of a coach. In fact, the latest movement in CBT even removes the therapist altogether. This “self-help” CBT assists patients through online guides and apps. And self-help accurately describes the way CBT is frequently packaged—with pure positivity and a can-do ethic. The “work” of getting better is up to the patient, who is responsible for her own success. This characterization sets up a scary flip side. When medications don’t work, the fault is that of the pill. When traditional talk therapy doesn’t work, you can blame a “poor fit” or a lack of chemistry. But in CBT, failure redounds to the individual. The cumulative message I’ve gotten about CBT amounts to: It’s effective, so it should work, and if it doesn’t work, it’s because you didn’t try hard enough. But managing mental illness is always hard work, no matter how you do it. Navigating the health care system while in a state of distress is hard. Convincing providers to take seriously the urgency of a pain that has no observable physical manifestation is hard. And doing this while being told that you’re not putting in enough effort of your own is really hard. Like many people who take psychotropic drugs, I hate being on them. Relying on mind-altering substances to function produces no small amount of shame, not to mention existential anxiety. I’ve tried to go off them many times in the hopes that the “real me” will finally be able to stand on her own. Each time, I run into the heartbreaking reality that my unaltered self is too painful to bear. The fact that CBT is helping people should be celebrated. But I need medication. And for me, the enthusiasm around CBT has prevented me from getting timely and appropriate treatment. It has also added a few bricks to the heavy burden I carry around about my inability to make myself better. That’s not fair to me, or to the other patients who are likely experiencing the same problems. The core of CBT’s cognitive restructuring essentially amounts to rewriting the stories you tell yourself—if you can think about something differently, you can maybe shift the way it makes you feel. Perhaps it’s time to rewrite some of the stories we’re telling about CBT.